Looking for something special to do this Valentine's Day? Here's a list of special offers from local restaurants and entertainment spots this Valentine's Day! When: Valentine's Day - Seating at 4, 6 & 8 PM - Reservations required! Riggatti's: Heart shaped pizzas! Just request it! Cafe Allure: Buy two entrees and 2 drinks get an appetizer for free! 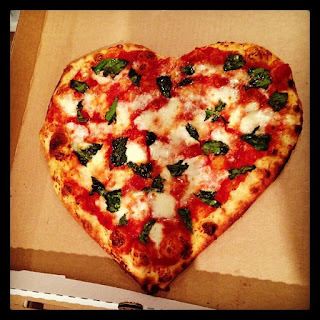 Brick Oven: Heart shaped pizzas! The Sugar Cookie: Heart-shaped Valentine's Day cookies! Zeppes: Buy one get one 50% off! Just mention their Instagram post! IG Winery: IG Winery will be hosting Sweet and Knotty Bakery. Sweet and Knotty specializes in delicious and exotic chocolate truffles! Pair IG Winery's wine with these delectable chocolates! This will be one romantic night! Fiesta Fun: Two different packages are being offered! Package #1: $25 for 2 bowling passes, $10 for Arcade and your choice of 2 specialty smoothies or 10 donuts. Package #2: $50 for 2 bowling passes, 2 attraction passes, $15 for Arcade, 2 medium drinks and your choice of one one topping heart-shaped pizza, 2 chicken quesadillas or 15 piece wings. Mike's Tavern: Dueling Pianos event! Click here for more information. This sounds so great. I am going to see if the Ledges still has openings. The dueling piano sounds like so much fun - too bad it is in Cedar City :-) Thanks for the ideas!